Figure 3-14. 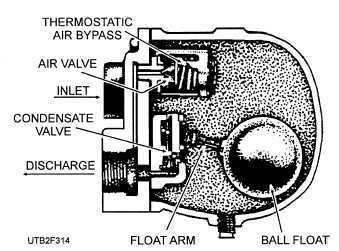 - A float thermostatic trap. Figure 3-15. - An impulse trap. free discharge of the condensate. The temperature of the remaining condensate rises and flashes back to steam. 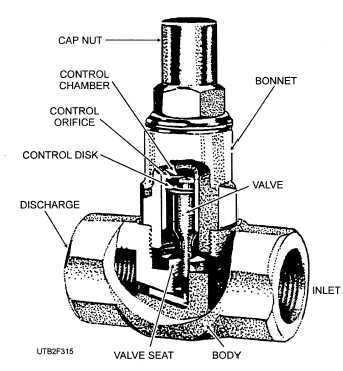 The flow through the valve orifice is choked and pressure builds up in the control chamber, closing the valve. 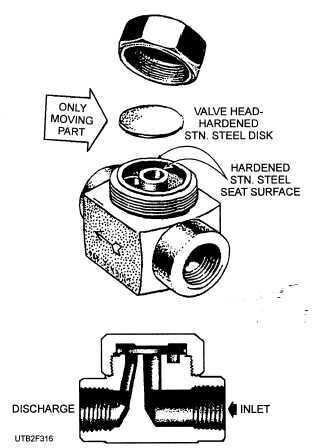 About 5 percent of the rated capacity of the trap flows through the valve orifice. The pressure on the discharge side of the trap should not be over 25 percent of the inlet pressure if the trap is to function properly. Very little maintenance, except some periodic cleaning, is required for the impulse trap. The trap may be disassembled for cleaning or repairing without disturbing any of the piping. THERMODYNAMIC TRAP. - A typical thermodynamic trap is shown in figure 3-16. It contains only one moving part - a disk. This disk is operated by changes in steam pressure. Pressure under the disk raises it to allow the condensate to be discharged. Droplets of condensate form on top of the disk. Then steam enters at high velocity and creates a low pressure under the disk; the droplets of water above the disk then flash into steam and create a high pressure above the disk. (You recall that water expands to as much as 1,728 times its volume when it changes to steam.) The high pressure against the top of the disk overcomes the lower pressure of the incoming steam, so the trap closes. As more condensate collects in the trap, the steam above the disk condenses and relieves the high pressure and the cycle is repeated. Figure 3-16. - A thermodynamic steam trap.